She couldn’t read the “logbook” in the “cache”—it was written in French. Using the “app,” she translated the message and noticed a “travel bug.” Rather than drop it off at a “travel bug hotel” and risk any chances of it being “pondered,” she took the “trackable” with her to its requested destination. Welcome to the exciting world of geocaching, a treasure hunting game with a language all of its own (see a glossary of terms, page 18), where curiosity, perseverance, and fun intermingle. Geocaching is a hunt to find what lies unseen by the untrained, unknowing eye of the average “muggle.” With more than 2 million caches to be found across the globe, geocaching is a great way to encourage teamwork, and to spend time together as a family. And what is the ultimate “cache” prize? Approximately 20,000 geocaches lie hidden right here in the Great Lakes Bay Region, waiting to be discovered! 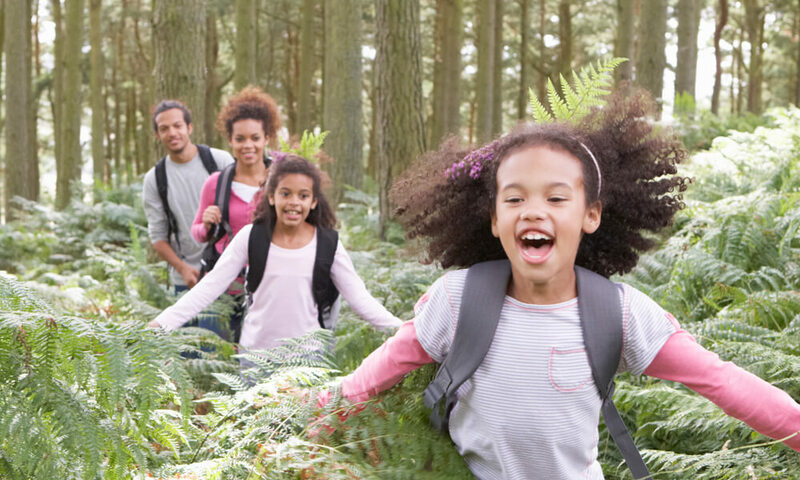 Disclaimer: Upon reading this feature, you and your family may get hooked on geocaching. Great Lakes Bay Family magazine cannot be held responsible for the adventures, high-fives, and family-strengthening fun that will ensue. Read at your own risk. Geocaching is a real-world, outdoor treasure hunting game that uses GPS-enabled devices. A person referred to as a “host” hides a waterproof container, a “cache,” that includes a logbook and trade items. The host lists the coordinates of the cache on a listing site—the most common is www.geocaching.com. Geocachers obtain the coordinates from the website, and the game begins. Stephanie Wirtz, outdoor recreation and event coordinator for Saginaw County Parks and Recreation, has been geocaching for a few years, and she teaches a course for beginner geocachers. Hence the fictional term “muggle,” borrowed from J.K. Rowling’s Harry Potter book series, and meaning someone who is not a wizard. In the geocaching world, a muggle is a person who is unaware of the geocache treasures that lie hidden all around them. It’s official: You are no longer a muggle. You are now aware that geocaches exist. Now what? Adventures in geocaching begin with a virtual trip to the website www.geocaching.com. On the site, you’ll create a username. 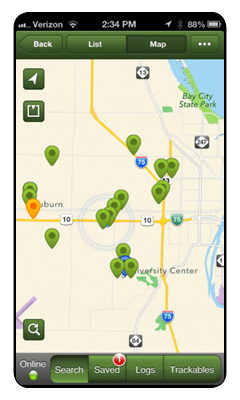 Then, download a geocaching app on your iPhone or Android device, or purchase a GPS. Now you can search for caches. When a Great Lakes Bay Region zip code is entered, more than 20,000 come up for you to find! Geocaching can lead you anywhere, from poking around a parking lot to hiking three hours through the woods. “Be prepared for anything,” Wirtz says. For starters, a cache is simply a waterproof container—an old film canister on the ground, or a camouflaged peanut butter jar hidden in the stump of a dead tree—with a logbook included in its contents. Caches contain little more than trinkets, stickers, and mementos that are up for trade, called trade items. The fun of geocaching often lies more in the hunt and the thrill of the find than in the cache’s actual contents. Once you locate a cache, you can sign its logbook. The logbook may be large or small, but should be in the cache’s contents. If you take an item from the cache, you should leave a trade item of equal or greater value. Then, put the cache back exactly as you found it: A cache that is moved or tampered with is referred to as being pondered, and is very unwelcomed. Finally, visit www.geocaching.com, log your find, and share your experience with others. 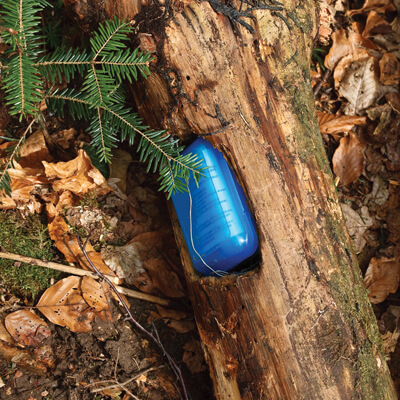 Trackables are yet another component in the world of geocaching. Some caches contain Travel Bugs®, Geocoins, or other items known as trackables—essentially game pieces to which a host has attached a goal. Goals are typically travel-related, such as visiting every country in Europe, or traveling coast to coast. A trackable bears a unique code that tracks its “hitchhiking” progress. By entering the code on www.geocaching.com, you can see where a trackable has been, and what its ultimate goal is. Some trackables travel hundreds of thousands of miles, thanks to geocachers who move them from cache to cache. Now, remember our friend from the opening paragraph who couldn’t decipher the French logbook? That friend was actually Wirtz, who found a stuffed ladybug trackable in a local cache that started its journey in France. Its goal was to reach Mackinac Island. Coincidentally, Wirtz had an upcoming vacation to Mackinac Island planned. She took the ladybug to its goal, and posted photos on www.geocaching.com for the host to enjoy! If you find a trackable, you can do one of three things: leave it as is, take it and position it closer to its goal, or drop it at a travel bug hotel. Traveling geocachers often visit travel bug hotels looking to help trackables reach their goal (see sidebar, page 17, for a local travel bug hotel location). On a recent vacation to Georgia, Wirtz brought a trackable from Michigan with her. It’s now one state closer to its goal of visiting a Harley Davidson store in every U.S. state! Dennis Darabos, a registered nurse in Saginaw Township, has been geocaching with his niece, Madey, 12, for about four years. He points toward geocaching rewards that aren’t found in the actual caches. Geocaching teaches trust in each other’s tracking skills and endurance, as well as perseverance. For instance, in a little patch of woods behind a local coffee shop lies a geocache that has evaded Darabos and Madey several times, even though they know it’s there. This glossary of terms will help you prepare for a geocaching treasure hunt. 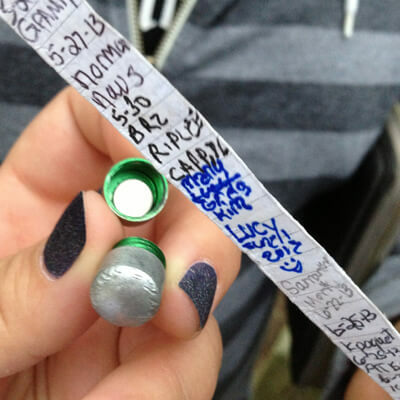 Geocache: A waterproof container of any size that includes a logbook for geocachers to sign when they find it. Cache: A common name for a geocache. Muggle: A person who does not geocache and is unaware of the hobby. Listing Site: A site that lists the coordinates and conditions of geocaches, the most common of which is www.geocaching.com. Host: A person who hides a geocache for others to find. Logbook: A book located inside a cache for visitors to sign once they’ve located it. Trackable: An item that a host can place inside a cache that has a goal attached to it. a cache for others to take. Travel Bug®: A common type of trackable that geocachers can purchase. Geocoins: Another common type of trackable, similar to a Travel Bug. Pondered: A cache that has been damaged or tampered with.